trust confided to my illustrious predecessor. same kind and partial hand." upon the office and my surrender of it." spirit of the Constitution as it was designed by those who framed it." with the constitutional authority of the Federal Government." interferes with private pursuits, the better for the general prosperity." 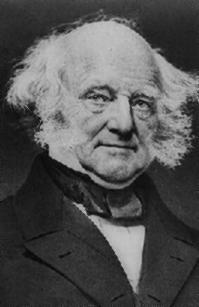 Martin Van Buren in response to the Panic of 1837.
lives and fortunes of his fellow-citizens." No evil can result from its (slavery's) inhibition more pernicious than its toleration.